Learn about the Civil War Battlefields in Western Maryland by reading Civil War Battlefields – On Site History Lesson Without Exams by Charlie Spence, WTA Member and Aviation Writer. It features a mini, but thorough tour of the destination, plus all you'll need to know to plan your trip including getting there, objective information on places to stay and eat, and things to do. At the end of the article, we've provided a summary of the contact information for your easy reference. Enjoy! along with the developments that set medicine on the path toward the modern era. One hundred fifty years ago Maryland was a divided state, sending some to fight for the North and some to join the Confederates in the Civil War. Today, however, there are no conflicting opinions about this being an ideal place to absorb the events of this historic period in America. A trip to the battlefields of Central and Western Maryland brings to life the events of this era. Visit Hagerstown, about 1 ? hours northwest from Washington, DC, or Baltimore, and you’re in the city that was at the crossroads of the Civil War and the town held for ransom by the South’s General Jubal Early. In any direction from Hagerstown you will be immersed in Civil War national memorials. South of the city, visit the site of the bloodiest single day of the war. At Antietam, 41,000 Southern soldiers under Robert E. Lee made the first of two attempts to move into the North and faced an 87,000-man Federal army. As you tour the battlefield, you will cross the little stone bridge where wave after wave of Northern troops were cut down by Confederates on higher ground. Before the day ended, Federal losses numbered 12,410 and Confederate losses reached 10,700. In addition to Burnside Bridge, your eight-mile drive through the battlefield includes The Cornfield, Dunker Church, and Bloody Lane. Take time to read some of the 350 monuments, markers, and tablets and to touch a few of the authentic cannons. July 4th holiday is one of the special times of year to visit the battlefield where at night they put on a fantastic fireworks show complete with firing canons and a live orchestra. Drive 30 minutes east into Frederick and soak up more Civil War lore. Remember John Greenleaf Whittier’s poem immortalizing the 95-year old woman who shouted “Shoot if you must this old gray head but spare your country’s flag” as she waved an American banner at the Confederate troops from the upper window of her home? You’ll find Barbara Fritchie’s reconstructed house and museum on West Patrick Street. The restored home of Frederick’s feisty Civil War heroine immortalized in Whittier’s poem. The battles were so fierce in this area of Maryland that Frederick became a medical center for both sides. At the National Museum of Civil War Medicine you will learn of the advances in medical treatment, anesthesia and plastic surgery developed at this time. Travel northeast from Hagerstown or due north of Frederick to the Gettysburg national battlefield in Pennsylvania. Here, too, the monuments and markers help you visualize the struggles that were fought there. The town of Gettysburg is quaint and worth spending time in to visit the shops and dine. Harper’s Ferry is only a short drive from either Hagerstown or Frederick. Here you will see the site of John Brown’s raid where he and his followers tried to secure weapons to arm the slaves. The South Mountain battlefield is nearby as is the town of Burkettsville where you will see the Gathland Arch, the only monument to honor journalists who covered the War Between the States. If you want more Civil War lore, it is a short trip from Hagerstown to Manassas, Virginia, where the battles of Bull Run were fought. 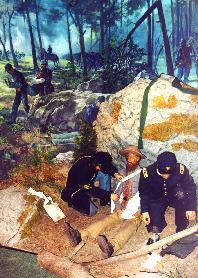 Besides the markers, monuments, and museums relating to the Civil War, many of the sites offer live reenactments of the battles at various times during the year. Drive through the battlefields on self-guided tours at no cost or take guided tours. For these, and entrance to some of the museums, there are small fees and most major credit cards are accepted. For details about special events, check these web sites: www.mdisfun.org, www.marylandmemories.org, or www.visitfrederick.org. Take your pick of two good airports—Frederick Municipal or Hagerstown. Both have instrument approaches, good runways, and services. Both are outside the Class B airspace that covers so much area around Washington DC and Baltimore. Frederick has ILS, VOR, RNAV, and GPS approaches. There are no landing fees, but overnight parking charges are $6 for singles, $10 for twins. Hagerstown has GPS, RNAV, ILS, and VOR approaches. No landing fee for aircraft below 6,500 pounds; parking fees range from $10 to $100 a day, but are waived if fuel is bought; overnight parking is $7.50 for singles, $10 for light twins. Check the airport web site: www.flyhagerstown.com. When approaching either Frederick or Hagerstown Airports, be careful not to enter P-40, the prohibited area over Presidential Camp David, which is now larger than shown on most sectionals. Plus, a variety of bed and breakfasts are available. You can check rates and book your room and rental car at WTA’s Online Travel Booking Service. Hotel savings can be significant. Nick’s Airport Inn—it’s name gives its location—offers a fine introduction to the area. Bavarian Inn, located in nearby Shepherdstown, West Virginia, presents cuisine with an old world touch. The Inn also has room accommodations overlooking the Potomac River. 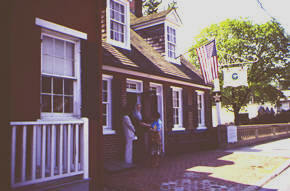 The Old South Mountain Inn is a four star restaurant near the battlefield site. The Province—American food with European influence; entrees $19 to $25. Notice: This information is current as of June 2002. It is recommended that you contact the numbers, and/or visit the websites above to determine any changes to the information.